President Obama’s administration continues to take full advantage of technology in reaching out to millions of Americans who by now are getting into the mobile phone syndrome. The latest of the administration’s foray into technology is by way of an iPhone/iPod Touch app that debuted recently at the iTunes store. 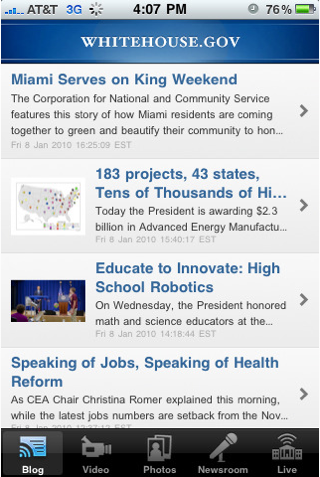 The Whitehouse iPhone App (iTunes Link) promises to connect with Americans by delivering real-time content from Whitehouse.gov to American iPhone users. One outstanding feature of the Whitehouse iPhone/iPod Touch app is the streaming of videos coming from the White House itself. It allows you to watch President Obama’s attendance to public events at the White House, web chats with members of the Administration as well. It’s a pretty cool app, if I may say so. As an opening salvo to the launch of this app, The Whitehouse.gov iPhone will be streaming Pres. Obama’s State of the Union address happening next week. In addition to its iPhone/iPod app, Whitehouse.gov is also planning to launch a new mobile-friendly version of its website. It would be interesting to note whether the introduction of a new mobile internet access will be as successful as other top iPhone apps or give Whitehouse.gov more users.